The most densely populated state in the nation, New Jersey, is a “corridor state” located between two major metropolitan regions: New York and Philadelphia. Benjamin Franklin famously referred to it as a keg tapped at both ends. It has prospered from this unique position, and in the 20th century it invested in highways, a global airport, and a seaport, and attracted companies to suburban office parks. In the 1980s and 1990s, with strong public leadership, New Jersey revitalized mass transit and made major investments in farmland and woodland preservation. It was a national leader both in growth management, and in affordable housing policies to address the state’s history of housing discrimination and segregation. For many decades, this was a formula for success: a pro-business climate, excellent infrastructure, improved transit connections to New York City, higher rates of affordable housing production, and bountiful natural resources—from the farms of Sussex County to the Jersey Shore. Although an expensive state with high property taxes and housing and labor costs, for many, it was worth it to live and work there. In the last decade, however, New Jersey’s economy has faltered, while neighboring New York City has surged. New Jersey incomes have stagnated, while housing costs have escalated. Lack of investment in new and expanded transportation capacity to New York City has failed to keep pace with growing demand, leaving New Jersey’s commuter-rail and bus riders frustrated and angry. Penn Station and the Port Authority Bus Terminal, which together account for more than 600,000 daily trans-Hudson trips—more than half of all commuters entering New York City every day—are over capacity and prone to frequent delays. Major repairs are needed to prevent a catastrophe and protect this vulnerable infrastructure from climate change. While New Jersey has preserved almost one million acres of open space in the Highlands, and a similar amount in the south Jersey Pinelands, there are always efforts to weaken or dismantle these protections. Superstorm Sandy exposed the state’s vulnerability to violent storms and sea-level rise caused by climate change, but little has been done beyond rebuilding in place. Regulations and incentives to promote affordable housing—especially in walkable downtowns and near train stations—were also dismantled over the last decade. Court orders have reaffirmed the state’s commitment to enforcing fair-share housing laws, but the Christie administration did little to support those provisions. Cities and walkable downtowns are now capturing most new economic activity in the tri-state region and across the country—and globally as well. 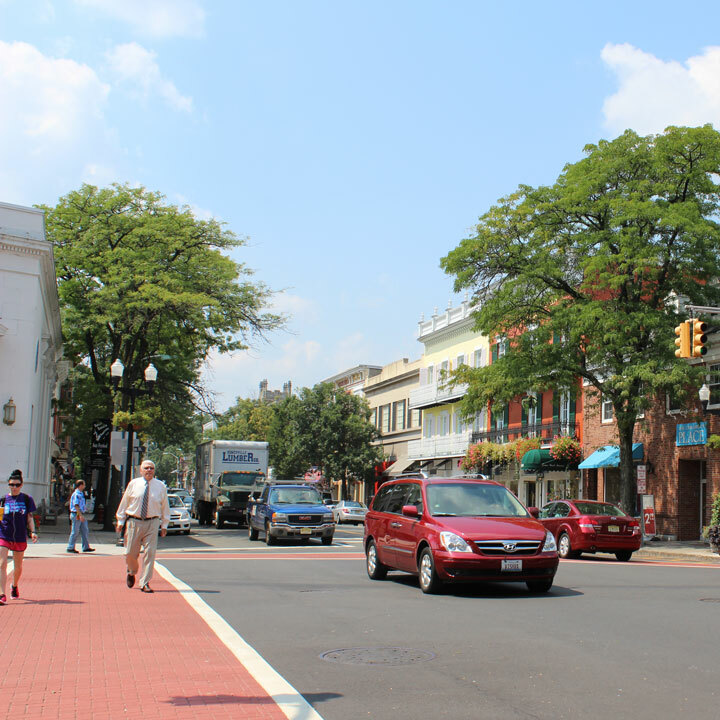 The Fourth Regional Plan outlines strategies for New Jersey to take advantage of this development by investing in its cities and downtowns, and capitalizing on its proximity to New York City on NJ Transit. First and foremost, New Jersey must solve its transportation crisis by building a new commuter rail tunnel under the Hudson River and a second bus terminal in Manhattan, in cooperation with New York State and City. Yet even these major investments would only provide enough capacity for a few decades, requiring further rail connections before mid-century. With a third pair of tunnels under the Hudson River to Midtown Manhattan, both the West Shore Railroad and New York, Susquehanna and Western Railway lines could be reactivated, giving Bergen and Passaic counties a one-seat commuter rail connection to New York City. In the meantime, PATH and the Hudson-Bergen Light Rail should both be extended to underserved communities, and investments should be made to increase their carrying capacity. A redesigned and expanded Newark Airport would reduce travel delays and generate more local jobs. New Jersey should invest in its major cities, including Newark, Elizabeth, Jersey City, Paterson, and Trenton. But as these cities gain new jobs and more housing, existing residents should be protected from rising costs and displacement. Redesigning streets to be pedestrian- and bus-friendly would help improve neighborhoods and provide better transit options. As on-demand and ultimately driverless vehicles become commonplace, cities must take measures to ensure they don’t dominate streets and roads and cause congestion. More intentional street management could improve the benefits of these technology-enabled vehicles, such as less need for parking and more efficient movements. These actions would lead to healthier environments for communities with high rates of asthma, diabetes, and other chronic diseases. New Jersey’s commercial corridors, office parks, and shopping centers can also become more walkable, transit-friendly places with new highway-design guidelines, model land-use codes, investments in rapid buses and other transit, and state incentives for inter-municipal collaboration. The state should also re-assert its national leadership in housing policy, reviving and strengthening its affordable housing laws with a statewide inclusionary zoning policy to ensure all new multifamily housing includes low- and moderate-income homes. A new national park in the Meadowlands would join New Jersey’s well-known natural attractions such as the Highlands, Jersey Shore, and Great Swamp, and help mitigate the impact of climate change on neighboring communities. At the same time, a comprehensive strategy for New Jersey’s coastal communities, coordinated by a regional coastal commission and funded by a state trust fund, would reduce the risks to both residents and the economy posed by climate change. New Jersey should also regain its leadership position in energy and environmental policy, rejoining the Regional Greenhouse Gas Initiative (RGGI), and working to broaden its carbon pricing into a comprehensive market for greenhouse gases.